On November 25, the PanLex team began a month-long stay in Yogyakarta, a city on the island of Java in Indonesia. Mataram, the historical region in which Yogyakarta is located, was controlled by several medieval and early modern kingdoms, and then for two centuries was part of the Dutch East Indies. 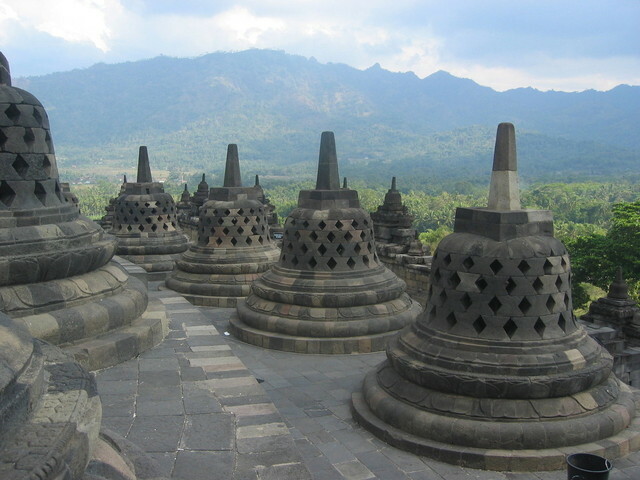 The region is home to two famous ancient temples, Borobudur and Prambanan. The PanLex team is in Indonesia in order to investigate ways to support local under-served languages.We chose Indonesia for several reasons. First, it has many under-served languages with large numbers of speakers, such as Javanese (84M speakers), Sundanese (34M), Batak languages (7M), Buginese (5M), and Acehnese (3.5M). Second, our team already has extensive experience in Indonesia, and two of us speak Indonesian. Finally, it is a fascinating and beautiful place to spend a month! Since our arrival, we have already identified many new dictionaries that will allow us to significantly improve the PanLex Database’s coverage in Indonesian languages. In the coming days, we plan to meet with professors at Gadjah Mada University (the most prestigious university in Indonesia), government ministers, and local advocates for Javanese and other languages. We hope to identify partnerships through which we can make high-quality translation tools available to speakers of these languages. We believe that in order for these tools to be successful, there must be community support and input. Our month here gives us the chance to solidify these relationships.